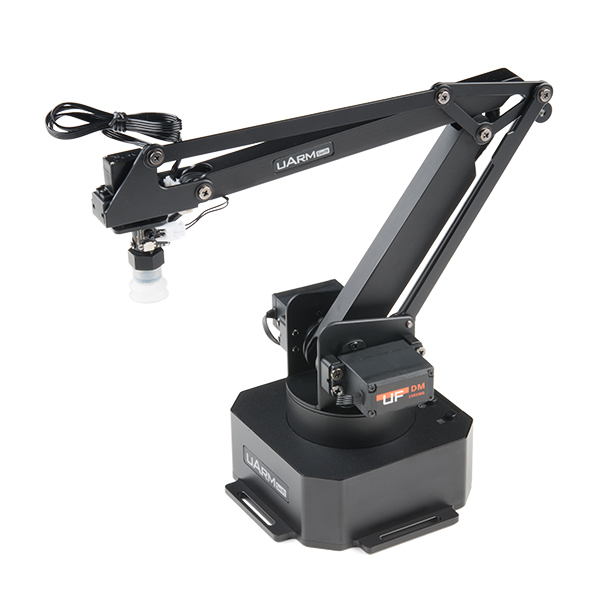 The uArm Swift is a high-grade desktop robotic assistant that can be utilized in many more applications than its predecessors, the uArm Basic and the uArm Metal. Built around an Arduino Mega 2560, the uArm Swift is an open-source, DIY-friendly robotic arm platform developed for makers and educational purposes. This little bot is extremely easy to use; almost anyone can learn how to play with it in a few minutes. The uArm supports visual programming as well as Arduino, Python, GrabCAD and ROS, providing plenty of options for a wide range of users. Unleash the maker inside and get uArm to make your ideas happen! 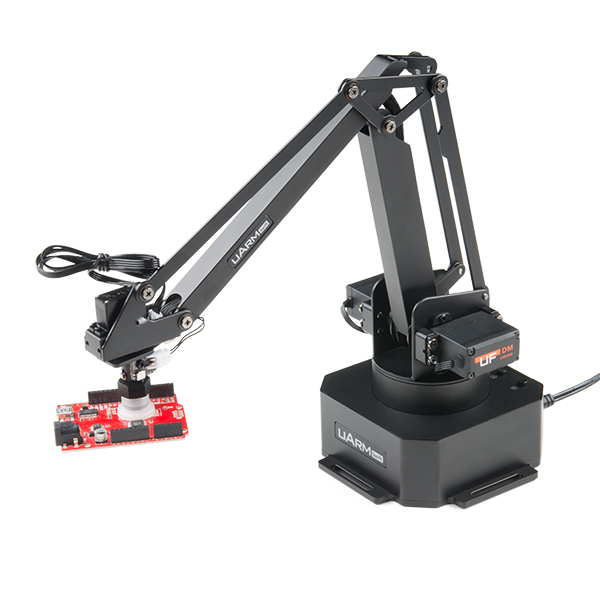 The uArm Swift has a repeatability of 5mm with a maximum payload of 500g and is one of the most affordable open source robotic arms on the market. It's small in size, light in weight and equipped with four built-in servo motors that enable it to move responsively. Unlike its older sibling, the Swift Pro, the uArm Swift features functions like Leap Motion gesture control and mouse/keyboard control, allowing you different functionality with the broader range of repeatability. Each uArm has several means of operation and control. The easiest way to start is with Offline learning mode, which requires no coding experience or complicated assembly. You simply need to power it on, press record, teach the arm what to do by dragging it...and that's all! uFactory has also developed two intuitive apps to control the uArm: uArmStudio comes in a clean, intuitive user interface with instructions, setting and diagnosis built in for Windows, Mac OS, and Linux; uArm Play is available for smartphones. Until today, 3-4 weeks after my purchase, I still have the broken arm at my hand and cannot return or replace it! Sorry to hear you're having trouble. We ask that you contact uFactory for help with your issue because they are the experts on this product. If uFactory determines that the device is defective, we will work with you to get it repaired or replaced.